Posted on November 23, 2016 at 11:06 am. The Gibbs-Reed family foursome entered our One Month Karma Yoga Program in October, wanting to deepen their experience of Family Week. They happily reflected together on their reception here. “It’s special for kids to see a community of people who are looking at a healthy way of living,” commented Randy Reed. 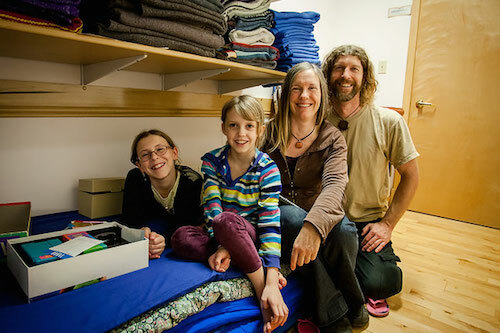 “For our daughters, too, I wanted to come because the leadership is strong women, with a focus on the Divine Feminine.” For himself, Randy welcomed daily Hatha Yoga that helped his continued healing from avalanche injuries. “It’s so special here,” agreed Cat Gibbs. “I always felt welcome to communicate what was needed to suit the family. We were 100% supported in that. There was such respect for our way of being and integrating as a family.